Simpsons fans will have to ready themselves for the departure of one of the show's favourite characters in the opening episode of the new season. Hints have been flowing that Krusty the Clown will meet his demise in an episode titles A Clown in the Dumps. Show runner Al Jean has been dropping clues recently that an important character would be killed off and the title of the episode serves as a pretty big carrot that the character in question is Krusty. However, Jean has stopped short of confirming it so other possibilities include Krusty's dad Rabbi Krustofski and Krusty's one time sidekick Sideshow Bob. Jean told TV Line that "the character that dies is portrayed by an actor who won an Emmy for playing that character." Krusty the Clown is voiced by Dan Castellaneta who has won plenty of awards for his contribution on The Simpsons including an amazing 6 Emmys for Outstanding Voiceover Performance. Krusty the Clown was conceived by animator Matt Groening based on a local clown from the town he grew up in. He was drawn to look like Homer in heavy make-up as an ironic jab at Bart worshipping somebody that looks exactly like his hapless dad. 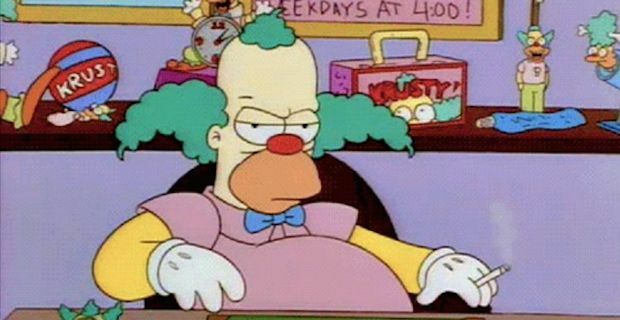 Krusty has featured in some of the most memorable episodes of The Simpsons and he often dove-tailed with Bart in various tussles with their nemesis Sideshow Bob, voiced by Kelsey Grammar. Jean has also suggested that Krusty's death will be a fitting one saying "It turned out bigger than we thought it was going to be. It’s not going to be this blood bath where they all get murdered." A Clown in the Dumps will be the first episode of season 26 of The Simpsons and it will air on the 28th of September on Fox in the USA. The Simpsons continues to break record after record and the episode will be the 553rd episode of the multi-award winning show.